The book is a typographic response to the music of Philip Glass. 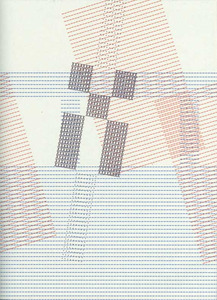 The original patterns were created on a Brother Electric Typewriter, then photocopied and overlaid to form patterns responding to a particular piece of music. These were then taken edit and selected to form a sequential narrative across the pages of the book. It is the first exploration into a larger project.